Originally from Pittsburgh, Fred Rodger considers Lititz, PA. to be his childhood home. Little did he know at the time, but his long-time friend, David Brumbach, would have an impact on his life. 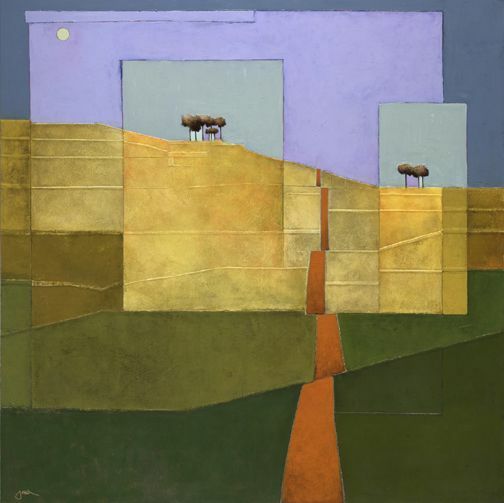 Brumbach, an accomplished artist himself, died in 1992 at the age of 42. Before his death, David said to Fred, you have talent, but you don't use it. At the time Rodger was teaching biology and coaching wrestling at an area high school. His friend's death was an awakening for Fred as he realized that we have only a limited time on earth, and we have one chance and limited time to accomplish whatever it is we're going to do. Fred began taking art and art history classes. He now holds a BS degree in biology from West Chester University, and both Bachelor and Masters degrees in art from Millersville University. After 33 years of teaching art and science, Rodger left the teaching profession to pursue a career as an artist. He still enjoys teaching and teaches art history on a part-time basis, but spends most of his time painting. His studio is located in his home which he shares with his wife (also an artist) and their Jack Russell terrier, Gizmo. Currently, when he's not teaching or creating art, he enjoys bicycling, traveling, and tooling around on his classic BMW motorcycle. But, for the most part, art-making became an obsession and a turning point in his life. Fred has participated in several group and solo exhibitions throughout Southeastern Pennsylvania, Delaware, and New York. He received one of his first recognitions in 1993 after his first solo show at the Lancaster Graphics Gallery when he was featured in Lancaster County Magazine as one of Lancaster's Extraordinary People.